Dr. Nkosazana Dlamini-Zuma, head of the African Union Commission (AUC) has called for intense dialogue over the recent political protests in Ethiopia, according to her it was imperative to find lasting solutions in the country. 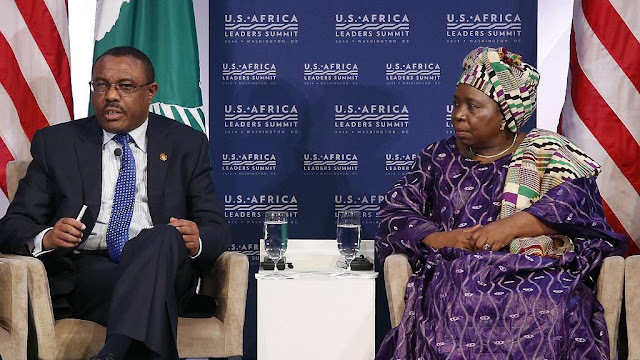 In a statement, Dlamini-Zuma tasked the Ethiopian government to ensure that fundamental human rights and freedoms were respected as guidelines for the October 9 state of emergency were implemented. She also expressed concerns over the continued restriction placed on the internet, stating that the government should take steps to restore access. ... urges the government to consider ensuring that citizens' rights to access to information and communication technologies, including internet services and social media are restored. “The AUC chairperson calls for calm and peace during the period when the state of emergency is in effect, and further urges the government to consider ensuring that citizens’ rights to access to information and communication technologies, including internet services and social media are restored,” the statement said. The AUC chair’s remarks come about a week after Ethiopian Prime Minister Hailemariam Desalegn announced a cabinet reshuffle that handed top cabinet positions to opposition politicians. The Prime Minister gave key government positions to two leaders from the Oromo tribe who have been at the heart of deadly anti-government protests over the last year. Reports indicated that protesters from the majority Oromo and Amhara ethnic groups had claimed that they were being marginalised by the minority Tigrayan-led government which they accused of monopolizing power and controlling the economy. The recent protest in early October was ignited by a stampede at a festival in the town of Bishoftu, where a stampede occured after police fired tear gas and rubber bullets to disperse anti-government protesters who were part of the festival. The government reports that at least 52 people died during the stampede, but denies that the security agencies were responsible. The government insists that the stampede and drowning resulted in the unfortunate deaths. The state of emergency that would last for at least six months is meant to quell the protests and to get the country back to normal. Dlamini-Zuma’s views are same as that of German Chancellor, Angela Merkel, who on a visit to Ethiopia asked the PM to accommodate protesters and for security to be measured in their response. Desalegn said that his government was planning to reform the country’s electoral system which had excluded the opposition until the recent appointments.